Remember that bit in The Voyage Home where Spock swims with some Whales because he’s goddamn Spock and he’ll do as he pleases? Well, the maddening merchandising glory that is San Diego Comic Con will never let you forget, because said scene is now a Bobblehead that you can buy at the con. What a world. Between this and their Saturday Night Live Tina Fey/Amy Poehler action figures, Entertainment Earth sure are racking up some weird SDCC exclusives — but this is certainly the weirder of the two. 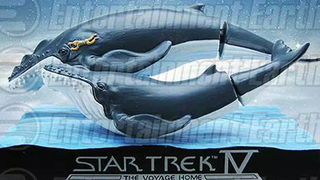 Depicting two Whales, one featuring a wee little Spock clinging on to the side, it’s actually a bit of a misnomer to call it a bobblehead. It’s the tails of the whales the wobble around when you give them a flick. Are you a fan of whales? A fan of whales with wobbly tails that look like they’ve been sliced off and poorly reattached? A fan of whales with a tiny little plastic being vaguely meant to resemble Leonard Nimoy attached? Then my friend this is the Comic Con exclusive for you. If you want a set, $20 will get you the Star Trek whale merchandise you desperately need at Entertainment Earth’s SDCC booth. The company are also taking preorders online — but those preorders are only for excess stock of the 1,998 individually numbered displays (collector’s edition whales!) that aren’t sold at SDCC itself. There’s little over a month before SDCC. That means there’s little over a month for someone to announce a batshit insane exclusive that tops the weirdness of this one. You’re reading Toybox, io9’s new blog for all things pop culture. From merchandise to awesome fan creations, TV recaps and critical commentary on the hot topics of the day, you can find it all here!